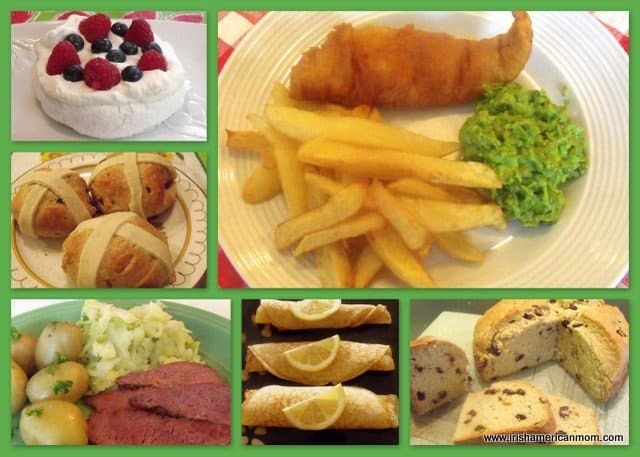 Finger food is perfect for any party, so if you're planning an Irish themed get together for a birthday party or St. Patrick's Day, why not check out my collection of Irish and Irish inspired appetizers? 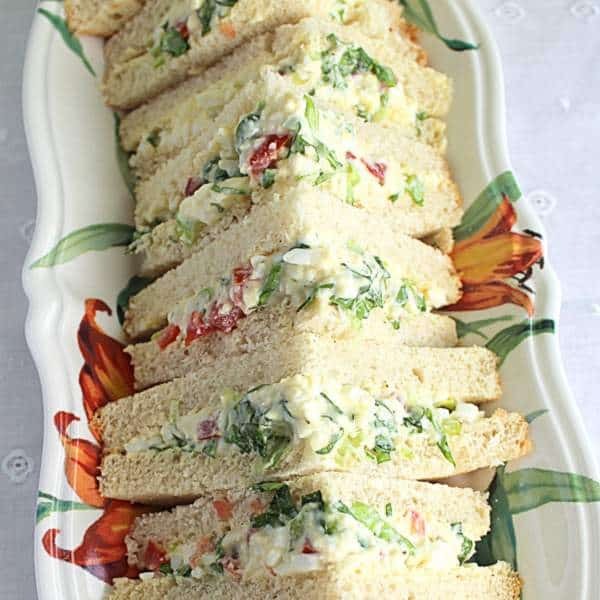 Irish salad sandwiches have been made by nearly every Irish house wife over the past five decades. 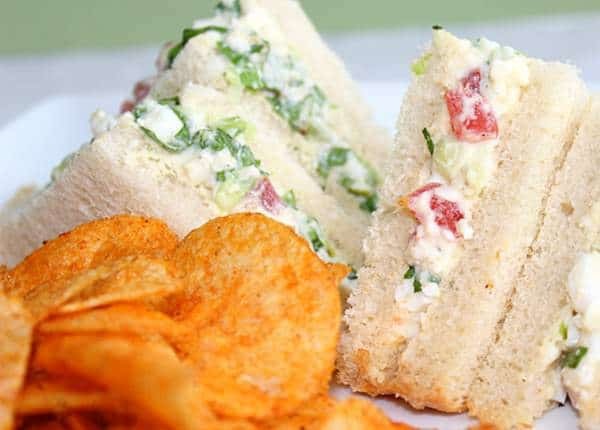 Sometimes called egg and onion sandwiches, or egg and tomato sandwiches, these triangular sandwiches may or may not include lettuce. I include lettuce in my version, but trust me, there is no right or wrong way to make a salad sandwich. It’s totally up to you whether you like more egg than tomato, or salad cream rather than mayonnaise to mix the filling. 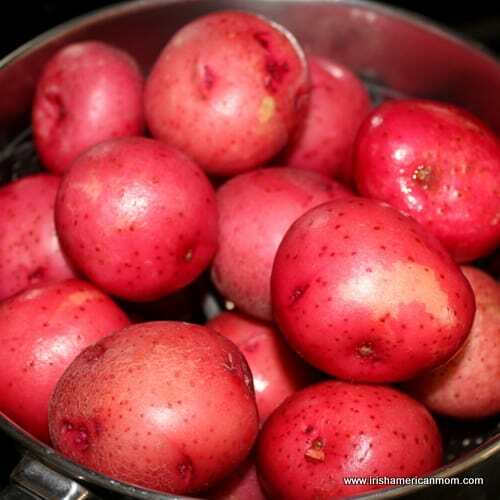 Made for get togethers big and small, these are a staple of quick entertaining menus in Ireland. 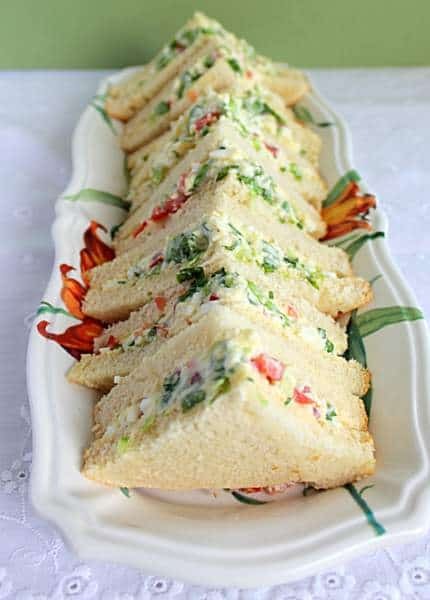 Many a plate of salad sandwiches has been whipped together to bring to a funeral gathering or wake, or for a family Christening, Communion or Confirmation celebration. 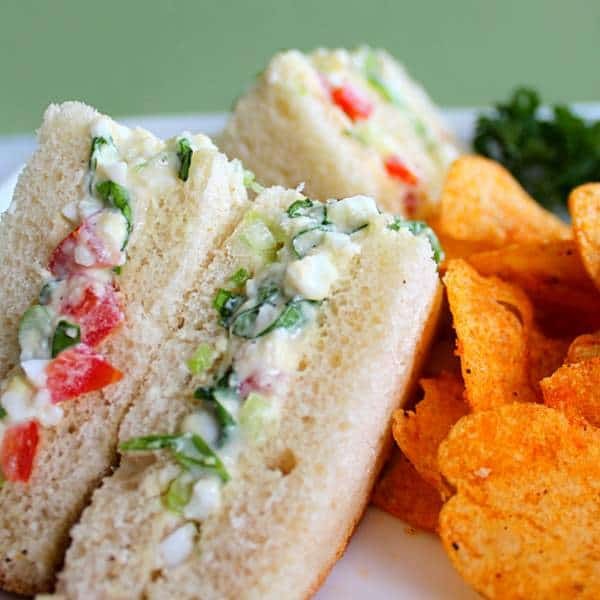 Hotels often serve these sandwiches as a light nibble at the end of wedding celebrations. 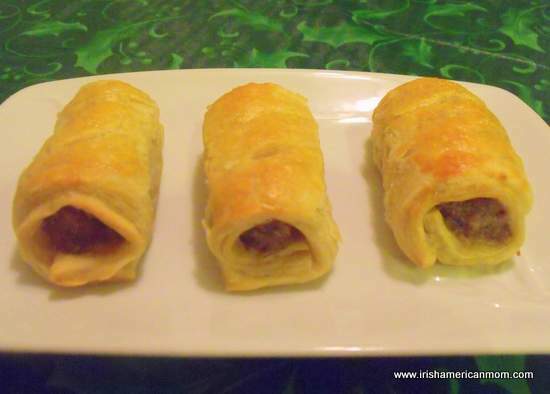 These are the sandwiches Mrs. Doyle made famous when she said …. Mrs. Doyle is a TV character from the brilliant comedy “Fr. Ted”. An ever diligent housekeeper, Mrs. Doyle made sandwiches by the dozen, cut in diagonals and served with aplomb to bishops and parishoners alike. Who can forget her urging???? 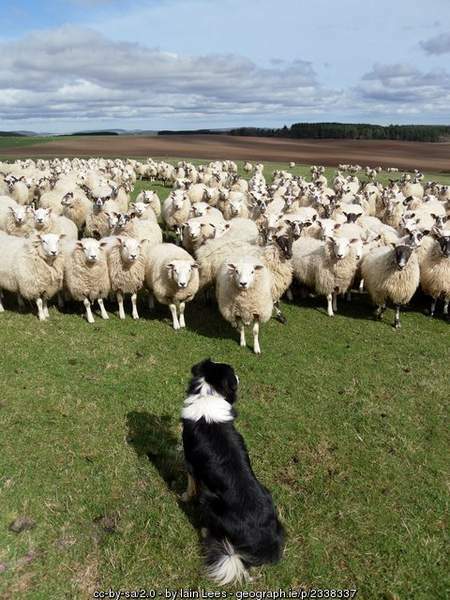 “Ah, go on, go on, go on! Never refuse a diagonal from Mrs. Doyle. 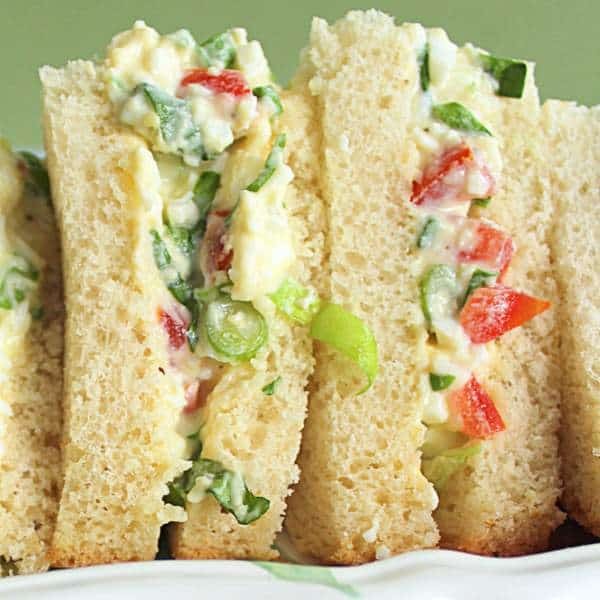 She’s mashed eggs by the dozen and carefully removed top crusts to make the most delicious Irish salad sandwiches ever!!!! My yearning for salad sandwiches was reignited when I was pregnant with my triplets. My mother came over from Ireland to help me towards the end of my pregnancy, and one day she made me salad sandwiches for lunch. I had forgotten how delicious this mix of egg, tomato, onion and lettuce can be. I was hooked. I ate my mom’s diagonals by the dozen until my trio were born. Perhaps that’s why my little girl loves these sandwiches for lunch. I’m still known to whip up a batch for a girls only lunch. Now, Irish sandwiches are far thinner than their American counterparts. The old saying goes that everything is bigger and better in America. Sandwiches definitely fit the bigger bill, but maybe not better. Equal and different in deliciousness is how I will judge this taste contest. I’ll never forget my first American work day lunch at the hospital canteen in Elmira, New York. 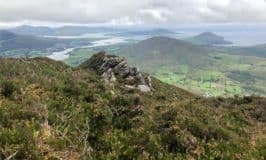 I ordered a sandwich at the deli counter, expecting a one inch high Irish sandwich, only to be astounded by the door-step size mountain that appeared before me. I don’t think I finished a quarter of that sandwich. I quickly learned to order a half sandwich for lunch in the hospital canteen. These salad sandwiches would fit the category of tea sandwich in America. 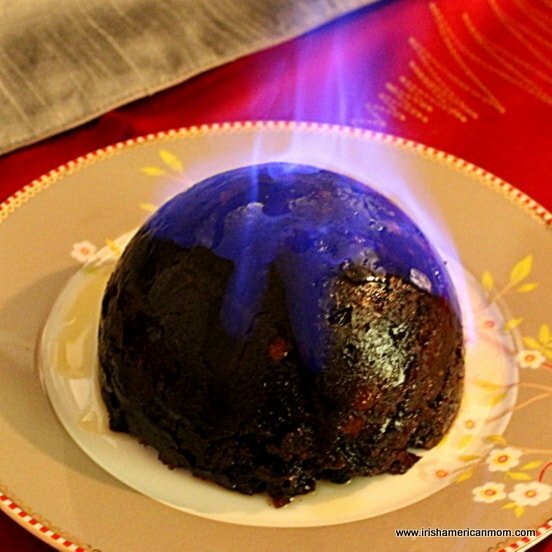 Here’s how I make them….. 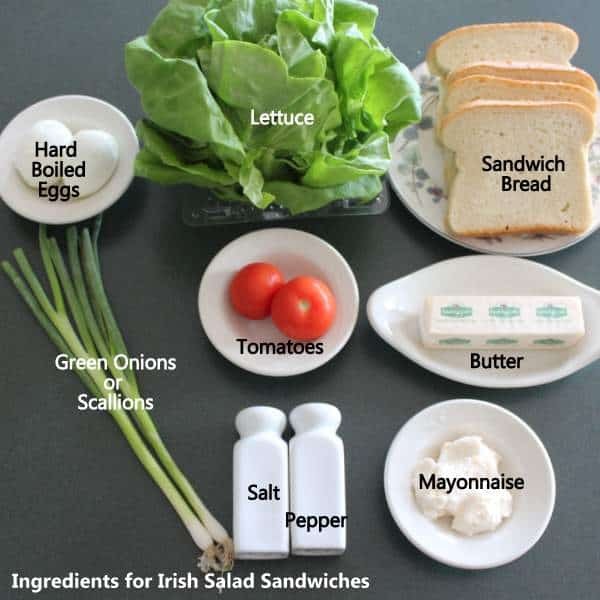 Ingredients for Irish Salad Sandwiches. Here’s a quick video showing how I make these savory sandwiches. Or just keep reading for step-by-step photos and written instructions. Let’s start by preparing the filling for these sandwiches. It’s basically mashed hard boiled egg with tomatoes, shredded lettuce and diced green onions. 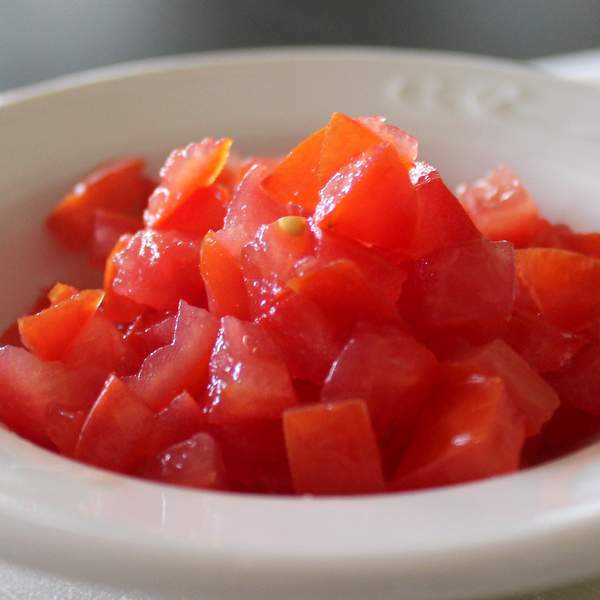 It’s important to scoop the pulp and seeds out of the tomatoes and only use the outer flesh. The seeds and pulp making the filling too wet and watery, so I halve my tomatoes and use a teaspoon to scoop out the tomato innards. In the picture above you can see how juice starts collecting in the scooped out tomato shell. I turn the half tomato shells upside down to drain before I dice them. Dice the tomato flesh into small 1/2 cm size pieces. I used 2 cocktail tomatoes which are similar in size to Irish tomatoes. One Roma tomato will work very well for this recipe. 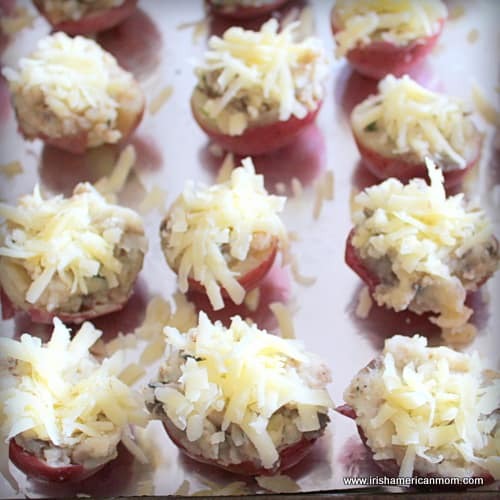 They tend to be more fleshy than other tomatoes so just perfect for making this filling. No big junks needed for these sambos. Just small little pieces. 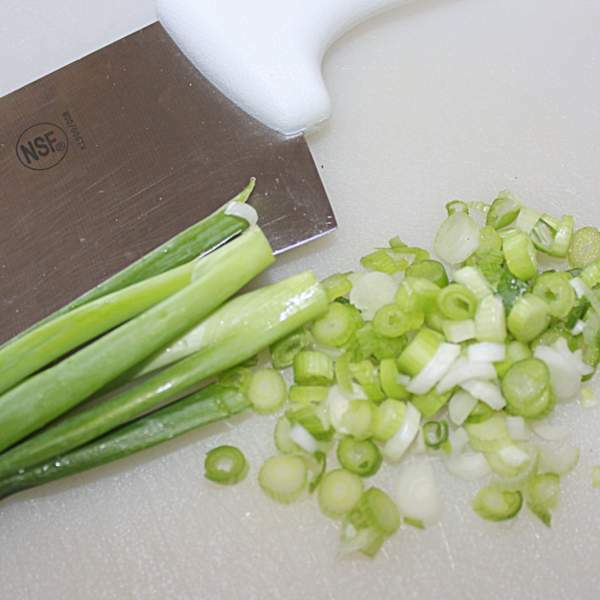 Slice the green onions very thinly. I only use the lower white portions, and stop where they get leafy and turn dark green, about 1/2 to 2/3’s way up the stalk. I use Butter lettuce since this was the type of lettuce I knew as a child in Ireland. It’s sold in American grocery stores as “living” lettuce. This lettuce is softer and less crunchy than Romaine or Iceberg lettuce. If you prefer crunchier texture, then use one of these lettuces. But I stick to Butter lettuce, to make sandwiches like I knew as a child. Next it’s time to mix all the filling ingredients together. 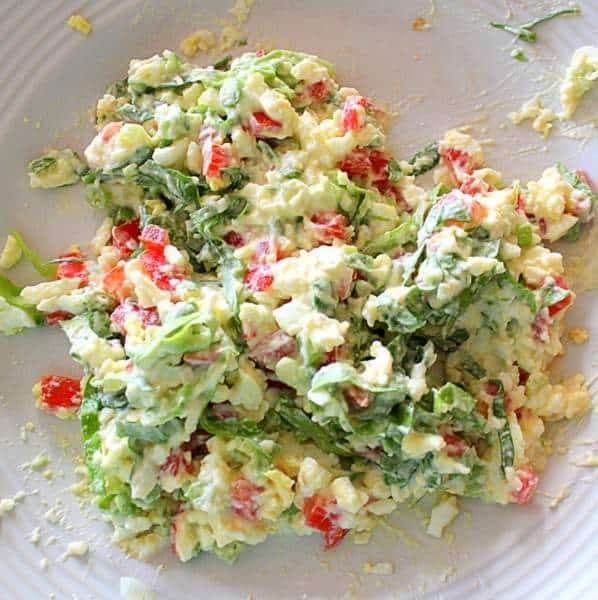 Place the mashed egg, diced tomatoes, shredded lettuce and diced green onion on a plate and mix it with the mayonnaise. 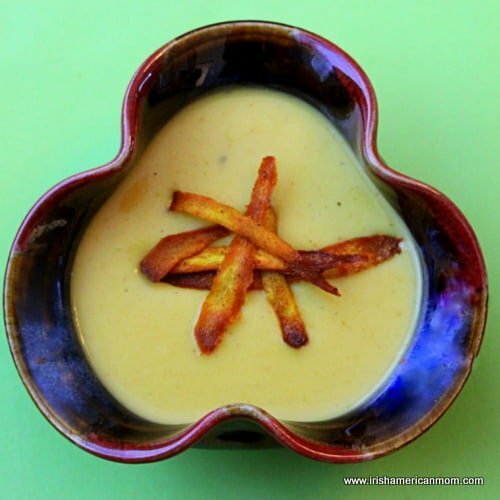 Many Irish cooks use salad cream instead of mayonnaise. This is an egg emulsion similar to mayonnaise but with the addition of vinegar and mustard, and a few secret spices only known to Heinz and the makers of Chef salad cream. It’s very important to season the filling mixture with salt and pepper. I don’t use much salt when I cook, but trust me, this filling needs some added salt. Next it’s time to butter the bread. 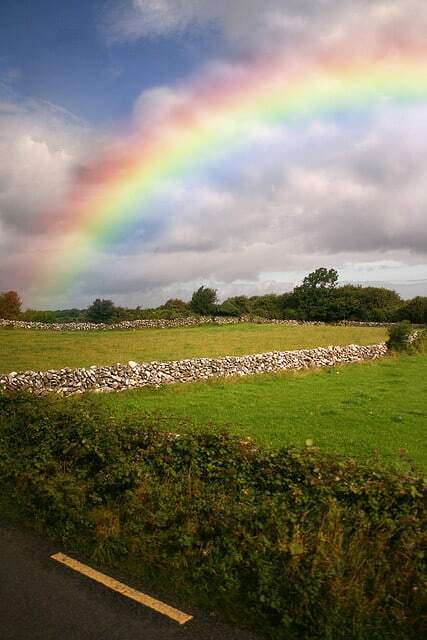 You can choose not to butter the bread, but in Ireland salad sandwich bread is always buttered. 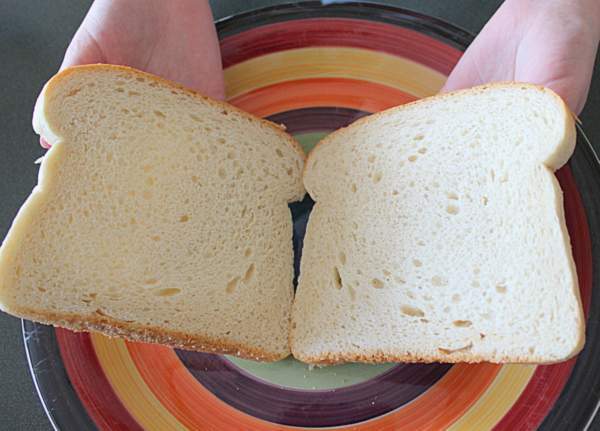 When preparing the bread, always take two slices and open them so that two matching sides are buttered. I remember buttering a whole slice pan the wrong way as a child. I just dipped in and buttered the upper side of every slice, instead of taking the slices in pairs and opening them for a perfect match. We learn by our mistakes! My mom made topsy turvy sandwiches that day, but hey, nothing has to be perfect in life. Next, divide the filling in two. 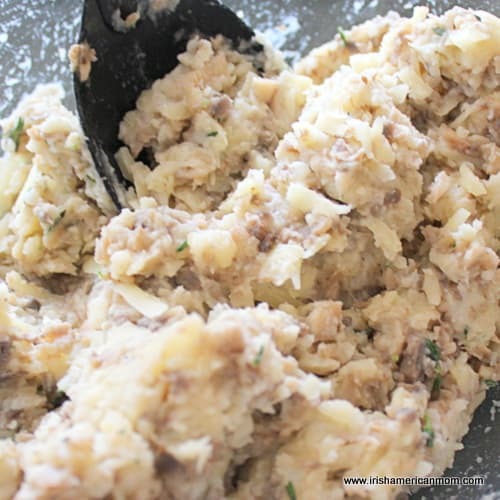 Spread it over one buttered slice of bread from each pair of slices. 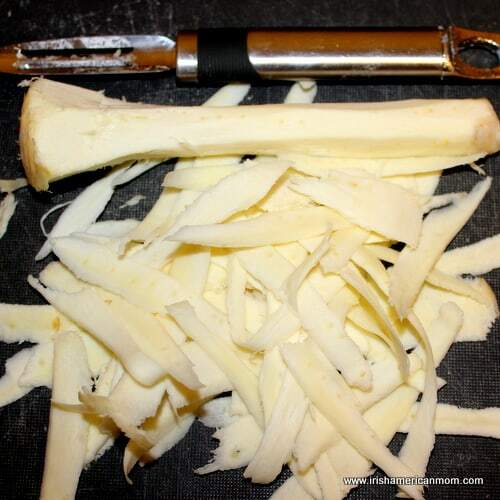 Once you place the top slice on each sandwich, use a bread or serrated knife to remove the top crust. Then cut the sandwich into four triangles, with two diagonal cuts. In Ireland, I would remove all the crusts, since our sliced pans are much larger than in America. Sliced pan is bigger in Ireland, and I will dare to say much, much better than the American sandwich bread. It’s a lot less sweet. Eliminating all the crusts on an Irish sandwich doesn’t reduce each triangular section to miniscule size like it does in America. I leave the crusts on in America. I used a country white sliced loaf of bread for these sandwiches, and the crusts are very soft. And there you have it, Irish salad sandwiches. They’re delicious served with chips. I only had American barbecue chips for my photo shoot, but my all time favorite is a packet of Tayto cheese and onion crisps with an Irish salad sandwich. Yum-meee! And don’t forget a cuppa tea to enjoy with your lunch. These little sandwiches are a perfect addition to any afternoon tea menu. These are always the first tea sandwiches I choose when enjoying an afternoon tea treat. Start by preparing the filling for these sandwiches. Halve the tomatoes and scoop out the seeds and pulp, and discard. 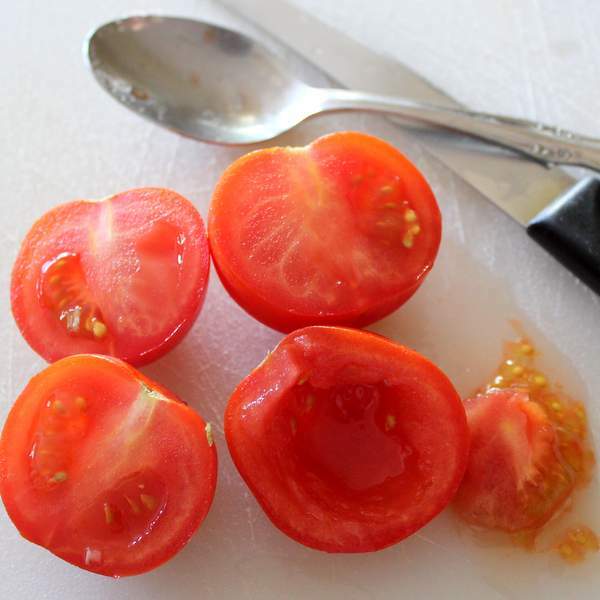 Dice the outer tomato flesh into 1/2 cm size pieces. Mash the hard boiled eggs. 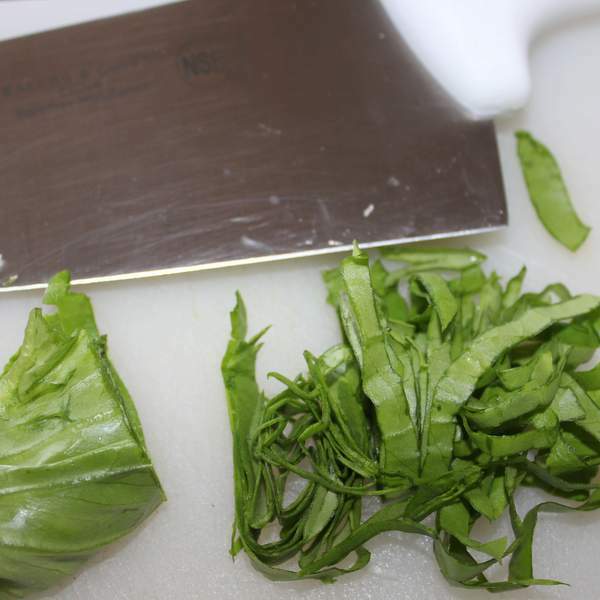 Shred the lettuce leaves thinly. 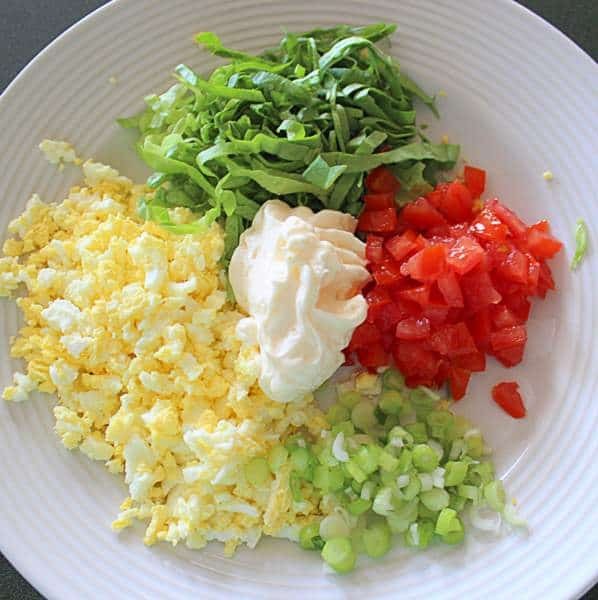 Mix the mashed hard boiled egg, diced tomatoes, green onions, lettuce and mayonnaise. Season the filling with salt and pepper to taste. Butter each pair of bread slices on the touching, matching sides..
Divide the filling in two and spread over the buttered side of two bread slices. Top each sandwich with its paired buttered bread slice. Cut away the top crust of each sandwich. 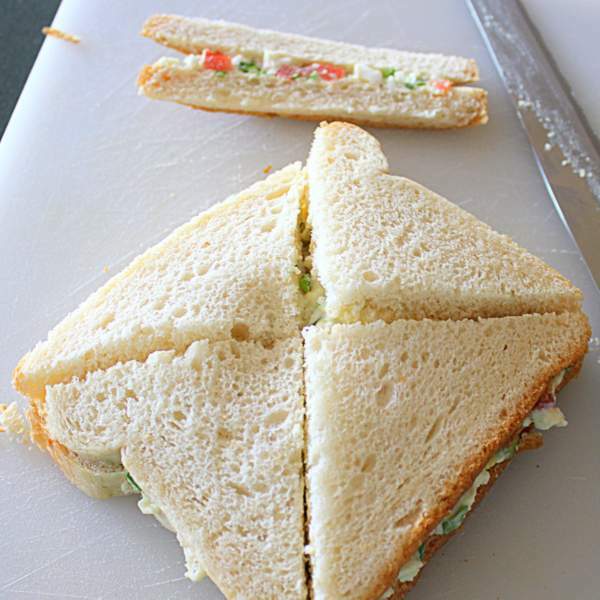 Divide into four triangles by slicing each sandwich with two crossing diagonal cuts. 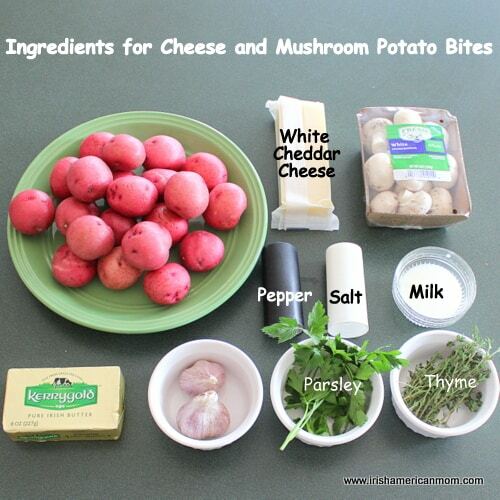 Arrange on a sandwich plate and serve with hot tea, and a side of chips or crisps. 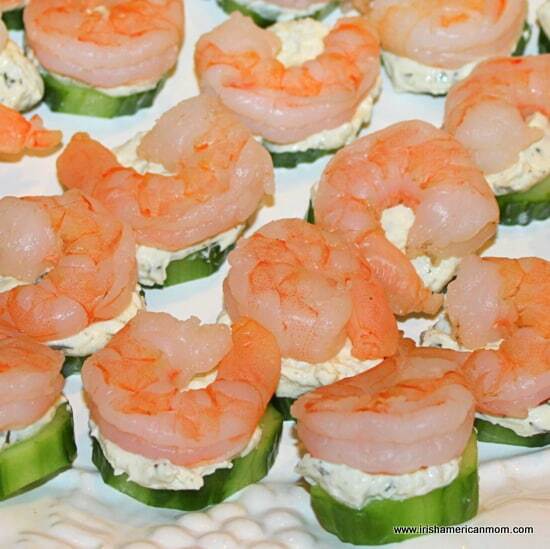 When I think of super easy starters, cucumber and shrimp appetizers immediately spring to mind. When it comes to party finger foods, these are fantastic. 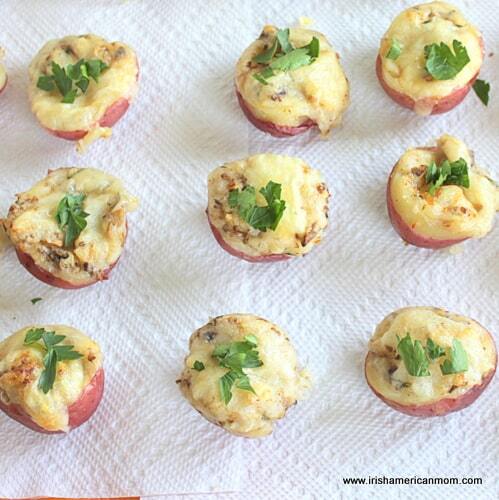 They also taste wonderful with brunch, or served as low-fat snacks. Shrimp and cucumber starters are so easy to assemble I make them for many occasions – summer barbecues, Christmas feasts, New Year’s parties and Paddy’s Day get-togethers. The list goes on and on. Even though I never tasted cold shrimp until I came to America, these super easy nibblers qualify as perfect Irish party food in my book. The secret is in the colors. These ingredients proudly boast the colors of the Irish flag – green, white and orange, so why not make them when celebrating St. Patrick’s Day. 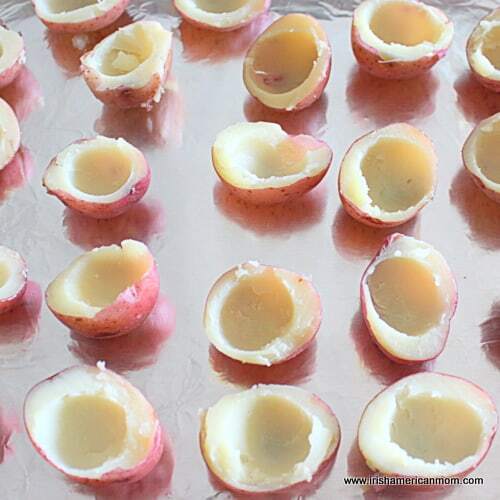 Another reason to love these easy, elegant snacks is their low-calorie count. Cucumbers are a healthy alternative to crackers. The herb cream cheese lends delicious buttery texture, complimenting the coolness of the cucumber and shrimp. And into the bargain, you can’t beat a no-cook party starter, especially during the hot summer months, when I try to avoid turning my oven on, or even lighting up a burner indoors. 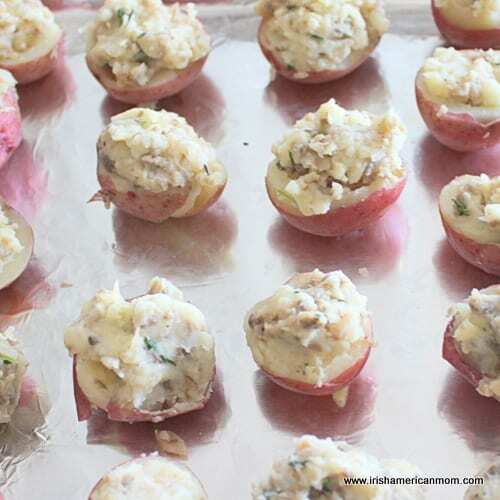 These are great for summertime hors d’oeuvres. When I was a kid I loved to say “horse devours”, and I was very good at devouring every morsel put on a plate before me. I wish my boys would eat like I did when I was young. Only my little girl licks her lips for foods like cold shrimp and cucumbers. I suppose this technically isn’t a recipe at all. Just one look at the picture and it’s pretty easy to guess how to put these wee bites together. 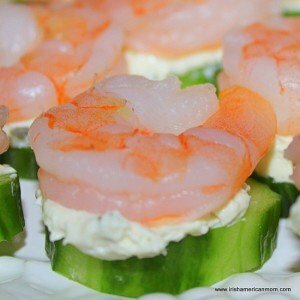 All you need is three ingredients to make this easy appetizer: cucumber, garlic and herb cream cheese spread, and of course, the star of the show, the shrimp. To make life extra easy I love to buy peeled, deveined, and cooked shrimp. If frozen I thaw them according to the package directions, pat them dry with paper towels and season them with a little salt and pepper. I like to go all fancy and create stripes on the cucumbers with my peeler before slicing them up. The variation of green shades makes the starters look more appetizing, but then again I am partial to forty shades of green. Pat the cucumber slices dry with paper towels before assembling the appetizers. 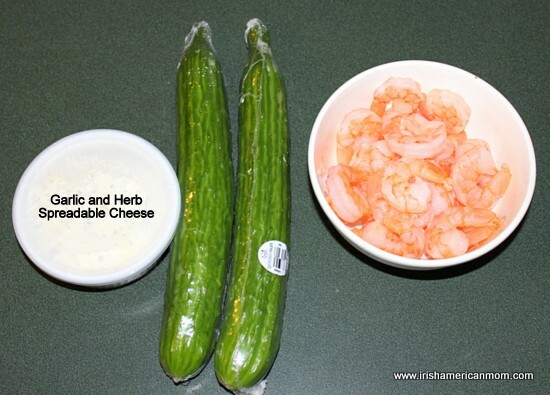 If you don’t wish to buy pre-made garlic and herb creamed cheese you can always create your own white spread to hold the cucumber and shrimp together. One alternative I sometimes use is a mixture of softened cream cheese, sour cream, dill, chopped fresh chives, fresh lemon juice, and salt. This creates a delicious spread. But nine times out of ten I take the easy route and buy a pre-made spread. Next comes assembly time. Take a slice of cucumber. Add a dollop of cheese spread, and then add a shrimp on top. 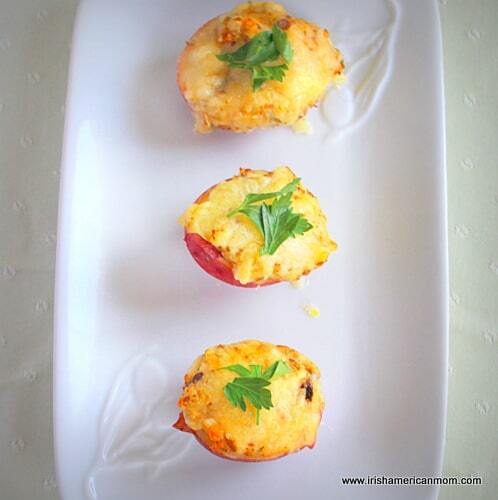 Voilà – an easy-peasy, simple starter that’s healthy and tasty too. 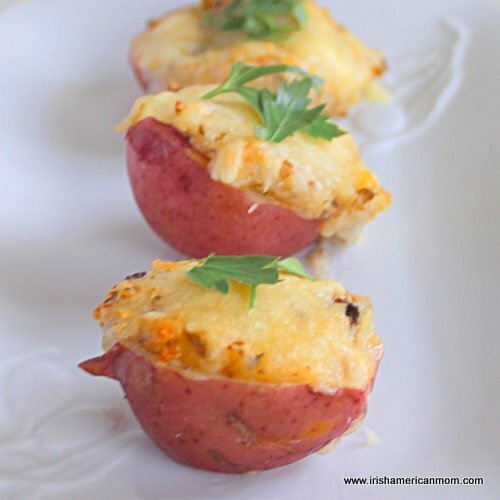 And don’t forget, when March rolls around, these little bites are perfect for St. Patrick’s Day. 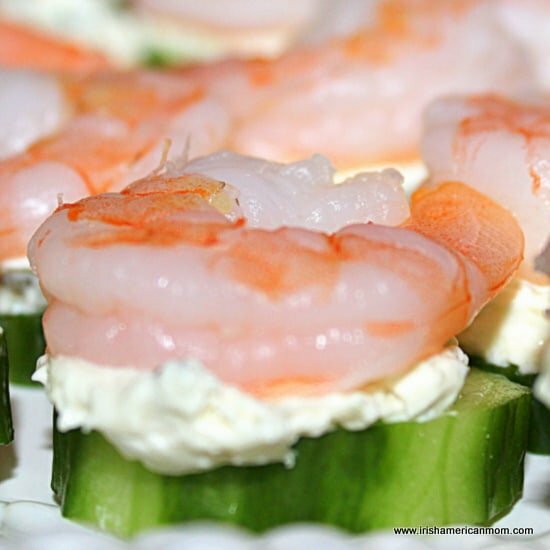 Cucumber and shrimp appetizers are fantastic party starters or finger food, that also taste wonderful with brunch, or served as low-fat snacks. Step 1 Thaw the shrimp per package instructions if using frozen shrimp. Pat the shrimp dry with paper towels. Sprinkle the shrimp with about 1/8 teaspoon of salt and pepper to season. Step 2 Peel 4 vertical stripes of skin from the outside of each cucumber, alternating dark peel and light no-peel stripes. 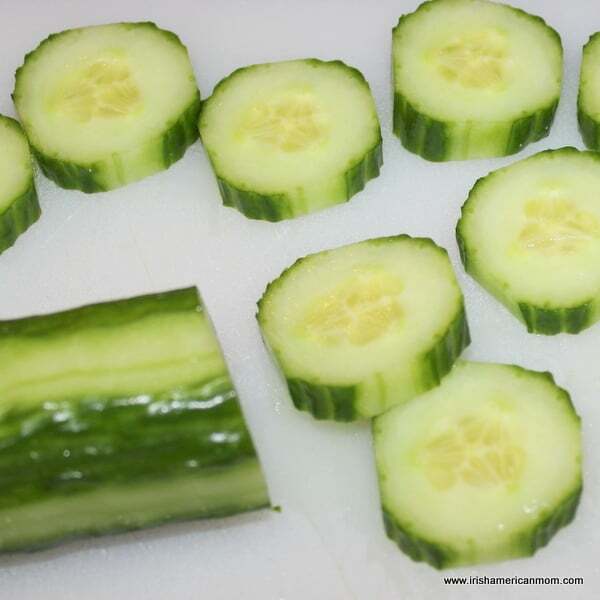 Cut each cucumber into 3/4 inch wide slices. Dry off the cucumber slices using paper towels. Step 3 Add a teaspoon of cream cheese spread on top of each cucumber slice. 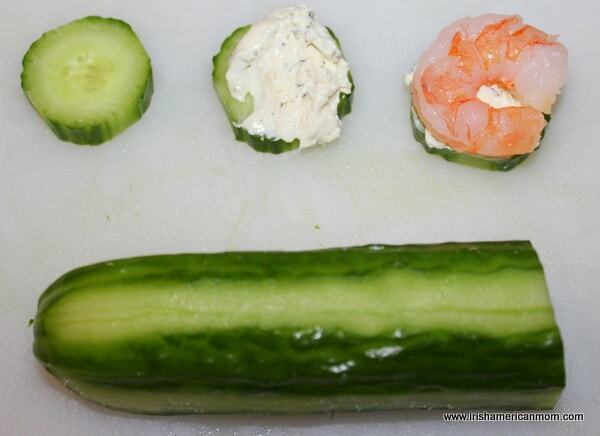 Step 4 Place one shrimp on top of each cucumber slice. 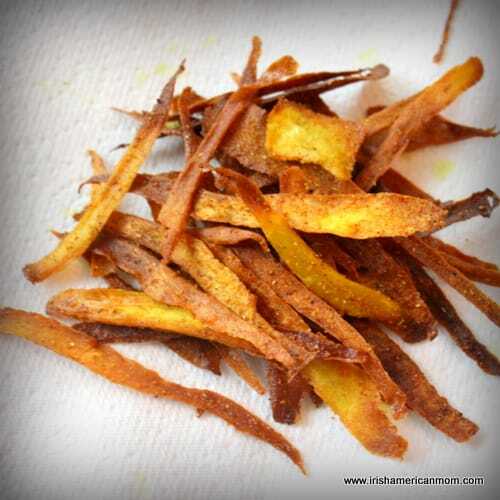 I hope you enjoy these light, crunchy, and flavorful starters as much as I do. My chicken tenders are made from chicken tenderloins, coated in panko bread crumbs and grated parmesan cheese, then baked until golden and crispy – a firm favorite in our house. Chicken tenders, chicken nuggets, chicken fingers, chicken sticks, chicken goujons, or whatever you choose to call them, these chicken tenderloins feature on our dinner menu at least once a week. In fact my boys would eat them every night of the week if I let them. They beg me for fast food chicken nuggets, but I’m afraid their Irish mom believes in home cooked meals, free from ingredients I cannot pronounce. To meet the demands of my fussy eaters I created my own, homemade, baked chicken nuggets. I tried many different coatings over the years, from crushed corn flakes to toasted whole wheat breadcrumbs, but I find panko mixed with parmesan cheese gets two thumbs up from my kids (or should I say eight thumbs up). 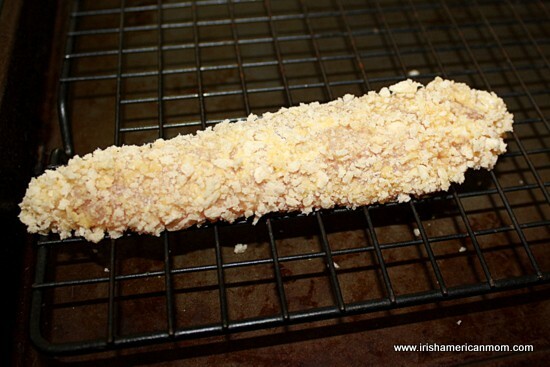 Before I share my recipe it’s time for a little Irish American Mom “chicken goujon” rant. For all Americans visiting Ireland, whose kids, like mine, cannot survive without their weekly chicken nugget feast, be warned. Nuggets cannot be found on Irish menus, except in McDonald’s. The preferred term is “chicken goujon”. Why Ireland couldn’t stick with one of the simple terms like nuggets or tenders or fingers, beats me. I always crack up when I hear my fellow Irish men ordering their “goujons”. 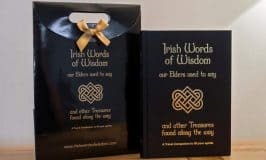 Correct French pronunciation does not flow from most Irish tongues, so I’m afraid the term usually sounds more like a “goooooo….jjohn”, especially in Dublin. I think during the Celtic Tiger boom years, we got carried away and tried to get all fancy by serving “goujons” in restaurants. What are chicken nuggets made of? I think that’s a six million dollar question, and the answer depends upon where you buy them. I once watched a TV documentary about how commercial chicken nuggets are made, and when I saw discarded pieces of chicken meat being compressed into beautifully uniform patties, I just knew I had to start making my own. As you can see from my ingredient photo there aren’t any complicated or unpronounceable ingredients required. 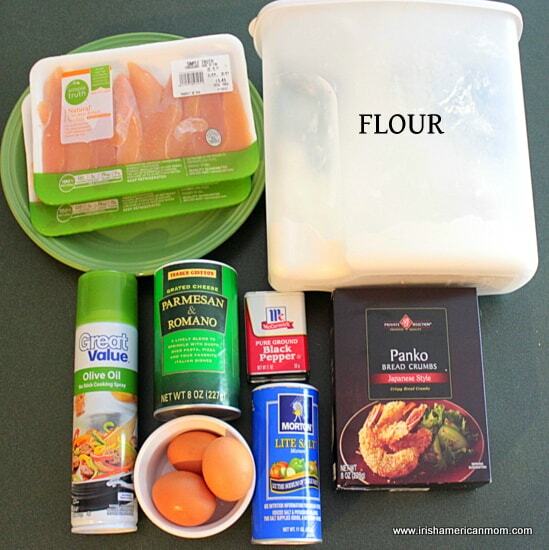 My homemade chicken nuggets recipe can be baked in the oven or fried, but I prefer oven cooking. Baked chicken nuggets have less fat than the fried variety. 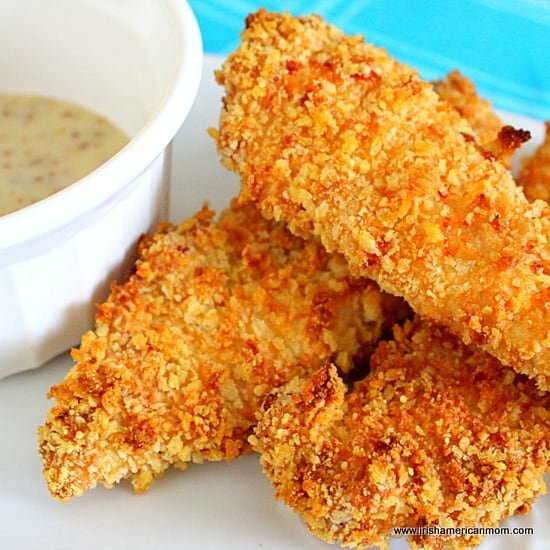 If you like crispy chicken tenders or crunchy chicken nuggets I find panko bread crumbs, mixed with finely grated parmesan cheese, are the perfect solution to this tender coating dilemma. But I’ve come a long way from Ireland to find these dry, crunchy Japanese bread crumbs, just perfect for my chicken coating needs. 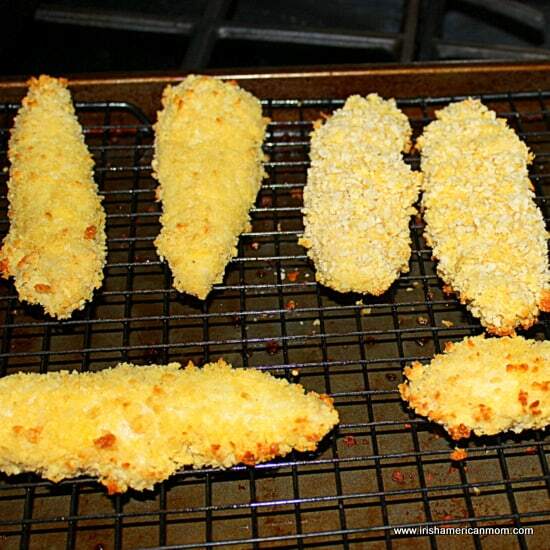 Before getting started, pre-heat the oven to 425 degrees F. To ensure crispy tenders a very hot oven is required. Next you need 3 bowls to prepare the dunking ingredients for coating the chicken. In the first bowl, add the flour and season it with salt and pepper. 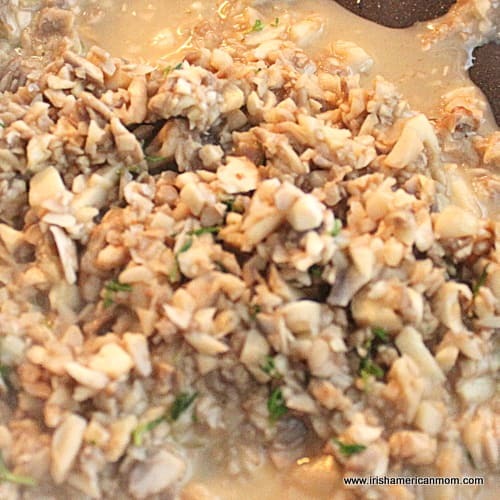 Break the eggs into a separate bowl, and whisk them together well. The last bowl is for the panko bread crumbs mixed with the grated parmesan. And now you’re ready to start coating the chicken pieces. First layer is a coating of flour. 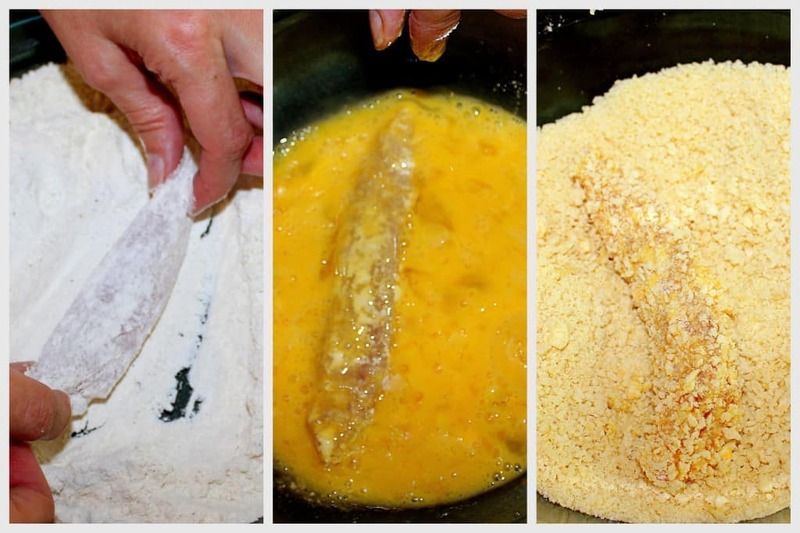 Toss each individual chicken tenderloin in the flour, then shake off the excess. Dip the floured tenderloin in the beaten egg, letting any extra egg drip off. 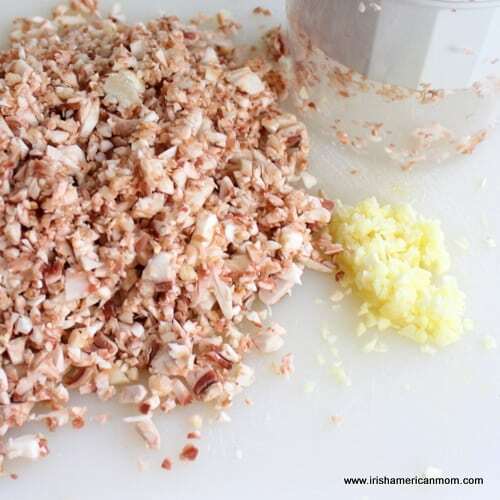 Next, roll the chicken tenderloin in the breadcrumb mixture. Gently shake off any excess crumbs. 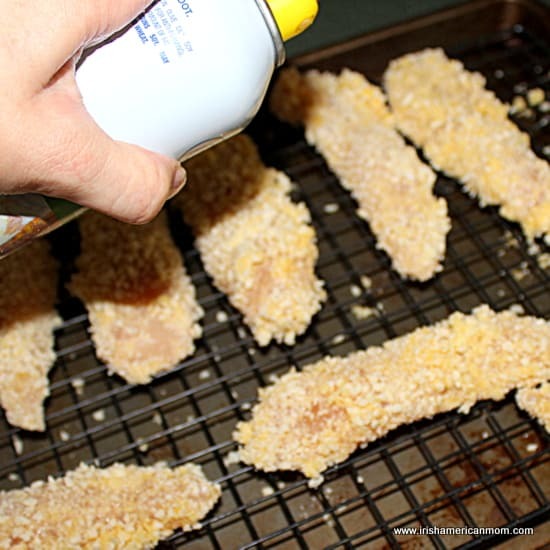 Discard any left over coating ingredients once the chicken pieces are ready for the oven. Place a wire baking rack in a baking tray. Spray the rack with oil. Place each chicken tender on the wire rack, allowing a one inch space between each piece. 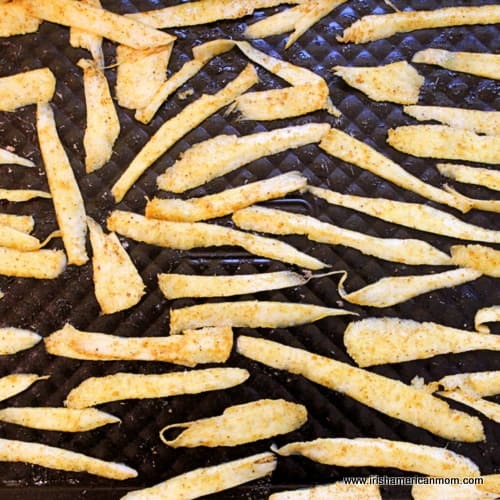 If the tenders are placed too closely together, they won’t get crispy. As each one cooks steam is released, so if they’re touching they just go soggy. Many cooks bake their nuggets directly on the baking pan. I like to use a wire rack. I find hot oven air beneath the nuggets keeps them crispy as they bake. Prepare and coat each tender individually. I find if I try to throw them all into the coating mixtures together the panko ends up being clumpy and less crispy when baked. 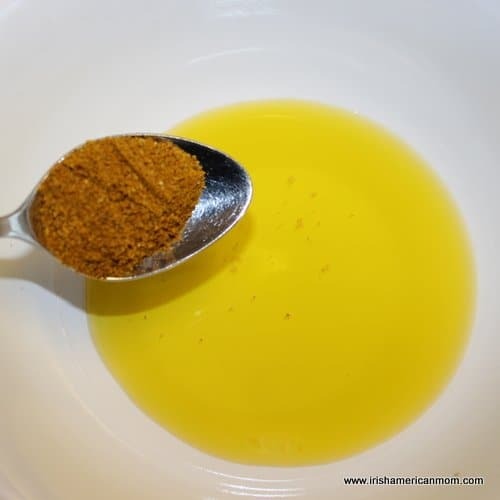 To ensure a perfect texture when cooked, spray the prepared nuggets with a little olive oil. Turning chicken tenders half-way through cooking. Place the tray in the pre-heated oven. After about 12 minutes remove the tray and turn the nuggets. You can spray a little more olive oil on this new upper surface of the nuggets. 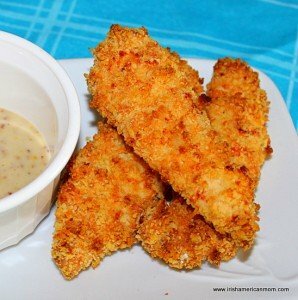 How long to bake chicken tenders? Until they’re cooked is the cheeky answer. I usually bake mine for 20 to 25 minutes. The exact time required depends on the thickness of each tenderloin. When both sides are golden brown and crispy, I usually slice the thickest one, to make sure the chicken meat is no longer pink, and is a succulent white shade. Now in case you think our meals are always ultra-healthy, please know I have been known to toss these tenders into my frying pan when I am in a rush to get dinner on the table. 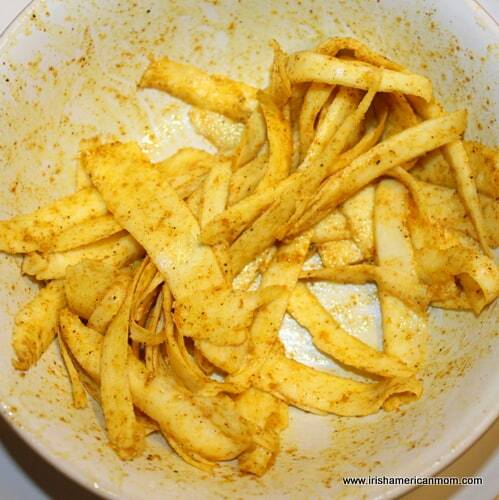 They cook beautifully when shallow fried in about 3 tablespoons of oil with a knob of butter melted into the oil. It takes about 7 minutes per side to fry them, but once again, how long to fry chicken nuggets depends on the thickness of the chicken tenderloin. My motto is always to test to make sure. 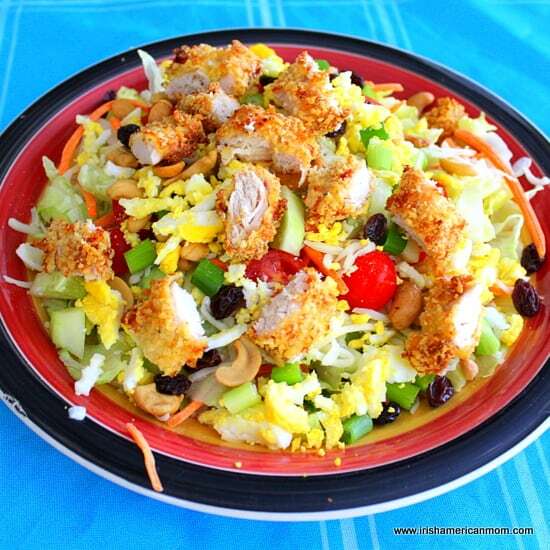 While my kids are busy dipping their nuggets in honey mustard sauce, my husband and I usually dice them up and toss them over a quick and easy salad. 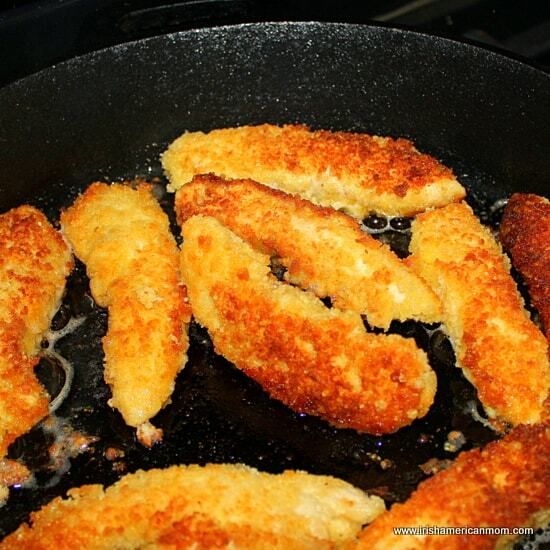 So there you have it – my panko crusted chicken nuggets or tenders or fingers or goujons. Whatever you call them, I hope you enjoy them as much as my kids do. 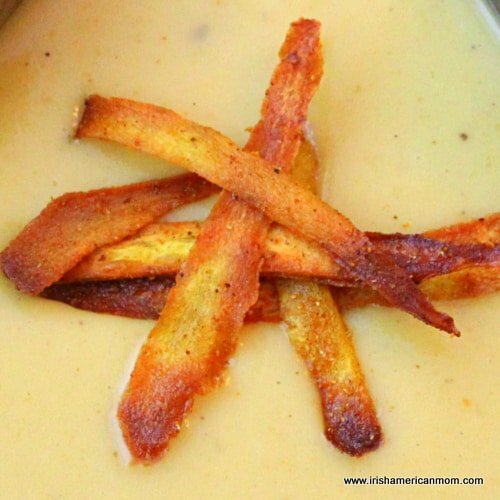 With honey mustard sauce, they’re finger licking good. Step 1 Preheat the oven to 425 °F. Step 2 Place the flour in a wide bowl with a little salt and pepper. Step 3 Add the eggs into another bowl and beat together with a whisk. 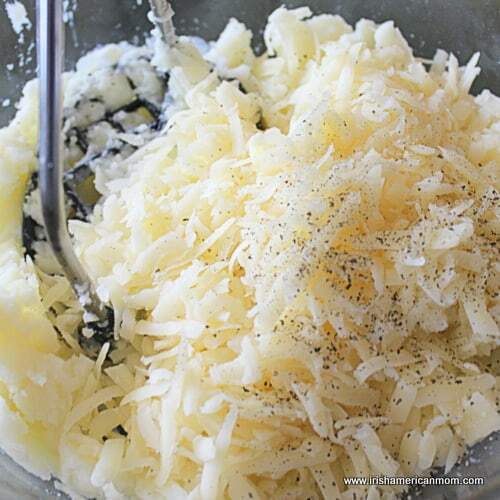 Step 4 Mix the panko breadcrumbs and the finely grated parmesan cheese in a third bowl. Step 5 Toss each individual chicken tenderloin in the flour, then shake off the excess flour. Step 6 Dip the floured tenderloin in the beaten egg, letting any extra egg drip off. Step 7 Next, roll the chicken tenderloin in the breadcrumb mixture. Gently shake off any excess crumbs. Step 8 Place a wire baking rack in a baking tray. Spray the rack with oil. Place each chicken tender on the wire rack, allowing a one inch space between each piece. Step 9 Bake in the oven for 20 -25 mins, turning them over half way through the baking time. Step 10 When they are completely cooked the outside should be a golden brown, and the inner chicken completely white. Remove from the oven and serve immediately.